The universal tale of love, hope and adventure opens for a strictly limited season, starring Kelsey Grammer, Danielle de Niese, Nicholas Lyndhurst, and Cassidy Janson. Man of La Mancha at last returns to the West End after 50 years, for a limited six weeks only. 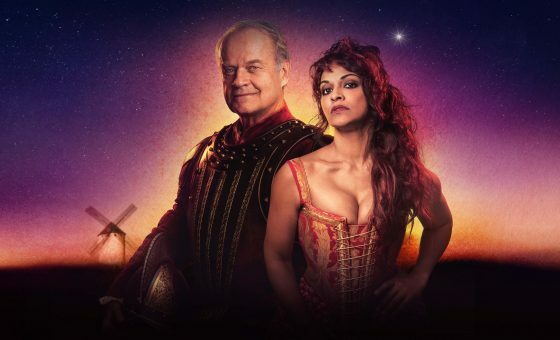 Emmy Award-winning and Tony nominated actor Kelsey Grammer, best known for playing Dr. Frasier Crane in NBC’s hit series Frasier will make his West End debut playing Miguel de Cervantes and Don Quixote and the international opera star and soprano, Danielle de Niese will play Aldonza/Dulcinea for 33 performances. Sharing the role of Aldonza and Dulcinea will be West End star Cassidy Janson and joining them as the Innkeeper/Governor is BAFTA award-winning actor Nicholas Lyndhurst.